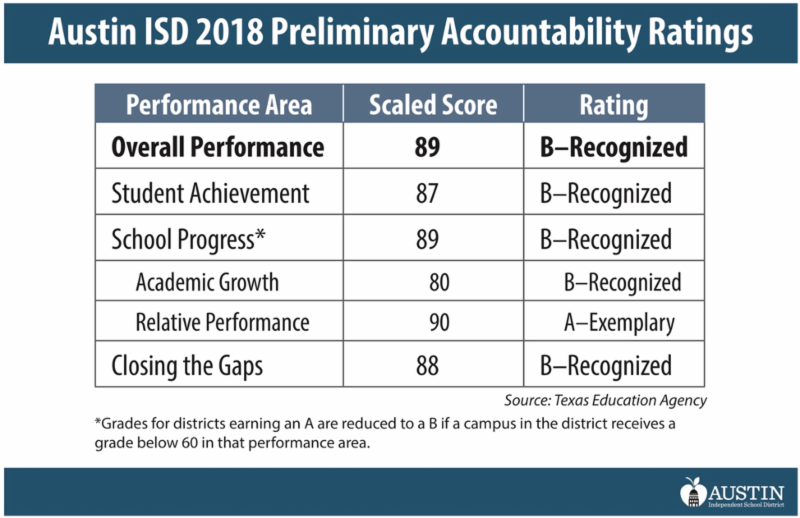 According to the Texas Education Agency's preliminary ratings released today, Austin ISD earned an overall performance rating of B, which is the recognized rating, with 61 schools earning academic distinction designations. "We're proud to earn a Recognized rating from the Texas Education Agency. We believe this shows AISD is not merely passing, but is an indication we are on the way to reinventing the urban school experience," said Superintendent Paul Cruz. "I am proud of our students and staff for all the hard work they have done in student achievement and closing the gaps thus far, and I acknowledge there is still work to do." For the fourth consecutive year, all AISD comprehensive high schools received a rating of Met Standard. Three AISD schools-Govalle Elementary School, Burnet and Martin middle schools-were rated Improvement Required in 2017, but met state standards this year. "We value the growth of each student and see success in the gains these schools have made," said Chief Officer for School Leadership Michelle Cavazos. "We applaud the individualized attention teachers have given these students and will continue to monitor progress to ensure we are meeting their needs as they arise." Mendez received an IR rating and the school will operate under a partnership with the Texas Science, Technology, Engineering and Math Coalition beginning this school year. This year, five Austin ISD schools-Widen Elementary School, Bertha Sadler Means Young Women's Leadership Academy, Mendez Middle School, the Rosedale School and Graduation Preparatory Academy at Travis-will receive preliminary ratings of improvement required. The IR rating at Widen Elementary School and Sadler Means YWLA are the result of a recent change in the accountability system-any campus that receives an IR rating in three of four performance areas automatically receives an overall rating of IR regardless of their overall score. AISD's graduation rate remains above 90 percent. AISD is recognized as the largest No Place for Hate district by the Anti-Defamation League. The National Association for Music Merchants Foundation designated AISD as one of the Best Communities for Music Education for its outstanding commitment to music education. This year, 220 Austin ISD seniors earned recognition for outstanding academic performance from the U.S. Presidential Scholars, National Merit Finalists, National Merit Semifinalists, National Merit Commended Scholars and College Board National Hispanic Scholars programs. AISD students' SAT and ACT scores continue to exceed state and national averages. "We continuously look for opportunities to best serve our students," said Associate Superintendent of Academics and Social and Emotional Learning Lisa Goodnow. "Austin ISD's success goes beyond any of these measures, including developing the social and emotional wellbeing of a child." For more information, please visit https://txschools.org.